I bought the Sunday paper on Saturday night, and checked the ads to see which stores had the Wii advertised, and I chose Target because they opened first (8:00 AM), and becuase they didn't have a bundle. 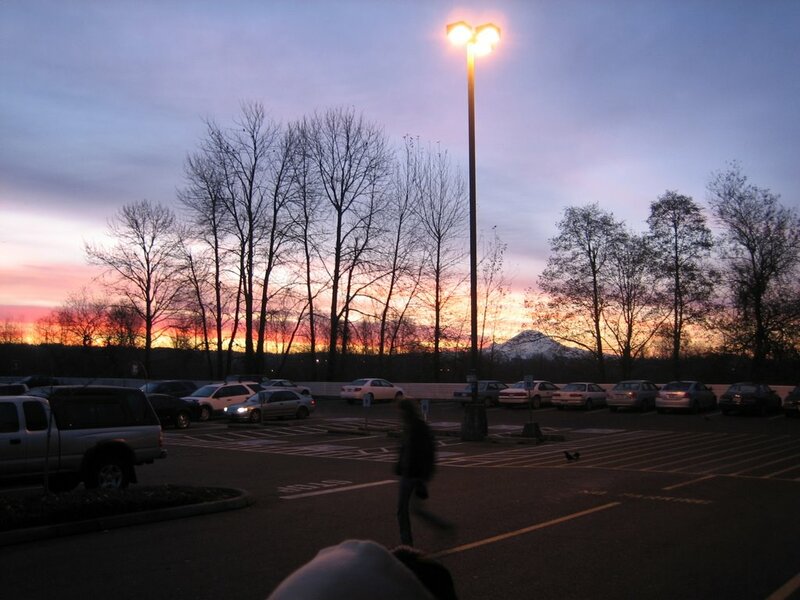 I got up at 6:15 AM and was at the store by 6:30. 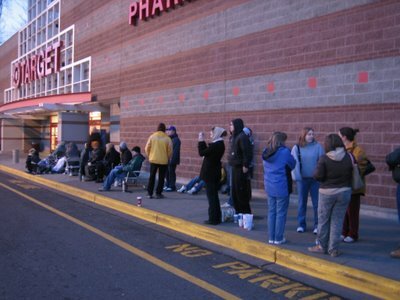 Here's what the line looked like when I got there. I got to watch the sun come up. 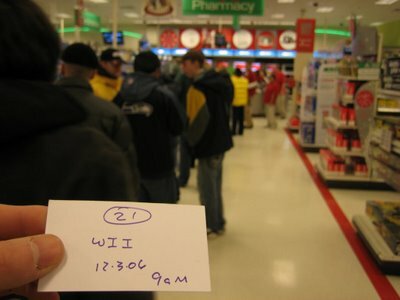 I was 21st in line for the Wii. There were 99 Wiis available, so people who got there at 8:00 still got one. There were only 3 PS3s. 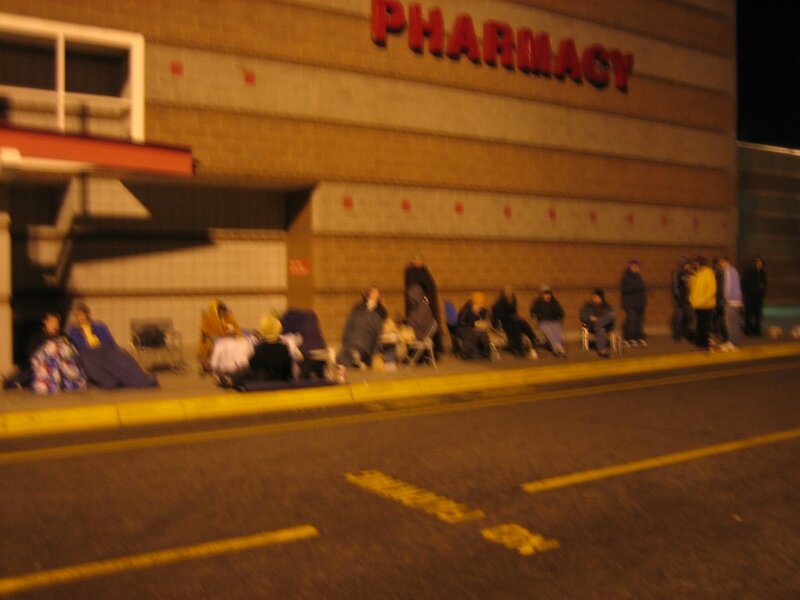 Hardly anyone was there for a PS3, though. The "9AM" part means that I had an hour to redeem my ticket. 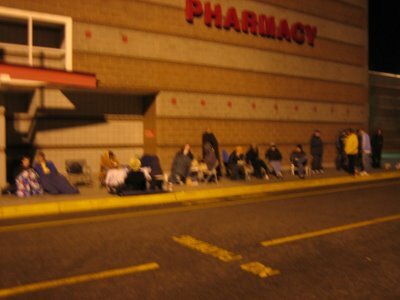 I could have gotten back in line after I purchased my Wii and gotten another one for a quick ebay $100 or so, but I figured I'd be nice. Of course, as soon as I got it home, I hooked it up to the Internet for a firmware upgrade. The WiFi was simple enough to set up. 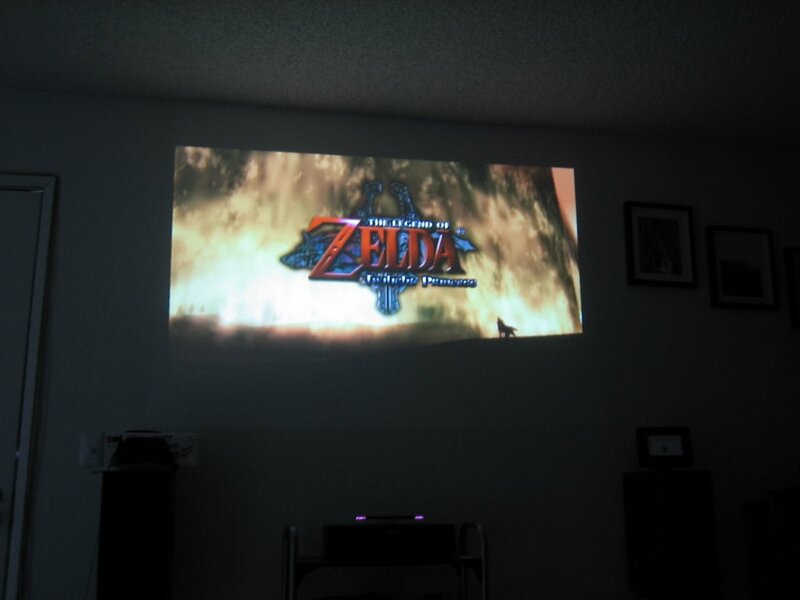 The Zelda title screen. Zelda is awesome! 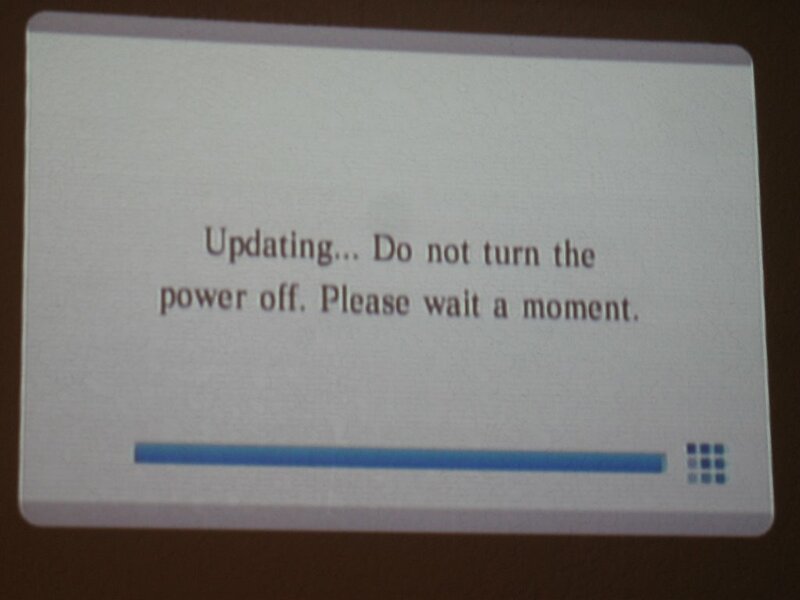 It takes a while for the game to get going, though. You can see the two infra-red lights on the sensor bar in this picture. Those aren't visible to the naked eye. The sensor bar isn't actually a sensor. Rather the Wii Remotes orient themselves to the screen by picking up the two lights. 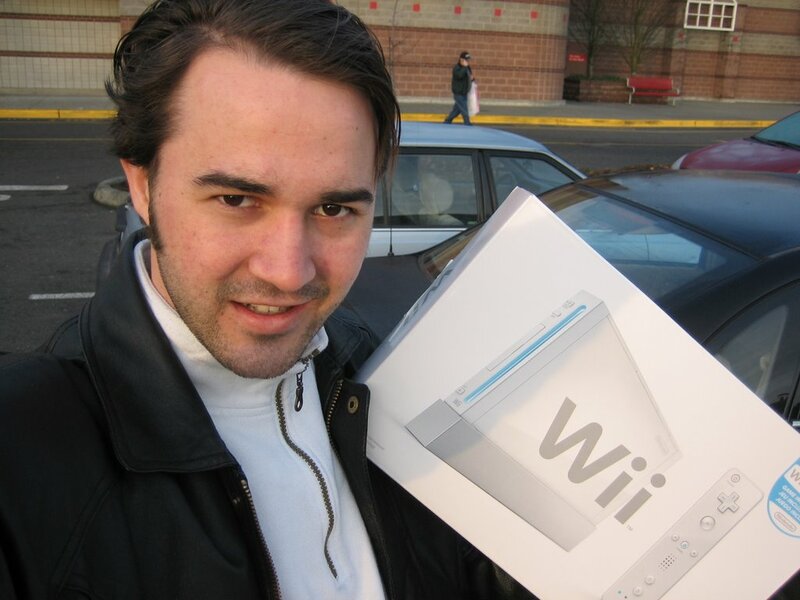 The Wii comes with a game called Wii Sports, which is a collection of fun, easy to pick up and play mini-games based on bowling, tennis, boxing, etc.. I had already purchased Zelda at GameStop, and I ordered Rayman Raving Rabbids on Buy.com (Buy.com has a $20 off $50 deal if you use Google Checkout. I had to add a random $2 DVD to increase the total to over $50.) Rayman looks really fun, especially as a multi-player game, but it hasn't even shipped yet. The Wii Remotes (the primary controller) aren't in stock anywhere, except of course on ebay for a hefty mark-up. I was able to find an additional Nunchuck attachment, but there was literally only one left. That's okay, because I'm content playing Zelda with my single Remote and Nunchuck until it arrives. The controller scheme is pretty well implemented. The only problem is that my setup places the sensor bar a couple of feet below the screen. I was able to raise the bar by sitting it on top of the Wii's box. The Zelda game allows you to further adjust the sensitivity and position of the sensor bar relative to your screen, and so overall the controls work pretty well. In particular, the control scheme for Zelda allows for fluid and natural control while engaged in mounted sword combat. I know there's a GameCube version of this game coming out, and I can't imagine it's anywhere near as easy to control in that situation. At least it must take some getting used to. 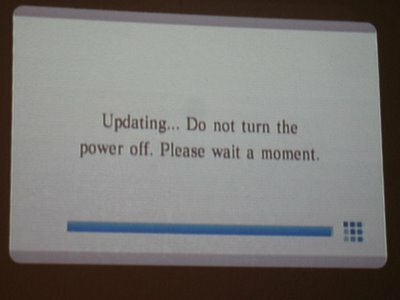 The other thing unique to the Wii interface is pointing at the screen to aim projectiles. Since my screen is a bit high on the all, this is slightly awkward, but other than that, it works great. One annoying thing that happened last night was that the WiFi stopped working. Every time I tried to connect to the Internet, I get a 51330 error, which basically means the WiFi isn't working. It isn't the firmware, because I was able to connect after I upgraded it. Hopefully the problem won't persist. At least I had already downloaded Sonic the Hedgehog and Mario 64, which were the only virtual console games available yet that looked good. I already have the original NES Zelda on a GameCube disc. One thing I find annoying is that in order to send messages from one Wii to another over the Internet, you first need to exchange a 16-digit numeric code. This is no doubt to protect the children from child molesters, but can't there be an option in Parental Controls to turn this off? It would be nice to be able to have your Mii walk around in different virtual environments and set up online multiplayer matches, or chat, or whatever. Speaking of which, I wonder if the Wii is compatible with USB and/or bluetooth keyboards. It would make perfect sense.